A few of us tried on these boots in the office and thought they ran a bit small. Maybe not a full size small, but at least a half size small. As you can imagine, size recommendations/evaluations on boots are subjective and we do the best we can for you. My overall recommendation would be to buy the size you normally wear, but if you are EVER between sizes, then choose larger. 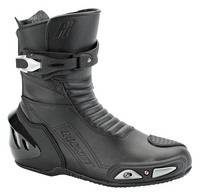 Overall, I found the width of the boot to be average to narrow… very much like Sidi boots.